A large percentage of your energy costs go towards heating and cooling your home. That is why it is important to ensure that there are no energy leaks in your air conditioned home. You can make a big difference to your home by tightly air sealing it using caulk. If done correctly by a Sarasota, FL caulking professional, you will end up saving a lot of money in the long run that would have gone towards paying your energy bills. By hiring professional caulking services, you will get quality workmanship and materials to suit all kinds of construction, whether you are working on a small extension or a big commercial building. 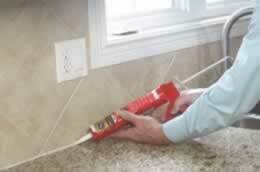 Our caulking Sarasota, FL professionals will advise you on which products will work best for your particular situation. Our Sarasota, FL caulking professionals have been trained on the best application techniques and have superior knowledge of the products used.